A four-year-old child vanishes so completely that rumor has it the devil took her. Drunken Tracy Walsh has an argument with her boyfriend, Neil Mansfield; snatches her screaming daughter, Daisy, from her bed; and takes off up the Burway toward the Devil’s Chair, an area of England long associated with witchcraft and strange happenings. Early the next morning, an unidentified caller reports a crashed car with a woman inside. Tracy is rushed to the hospital in critical condition, but a massive search turns up no trace of Daisy save one of her slippers. Leading the case is DI Alex Randall, whose wife is mentally ill. He’s made coroner Martha Gunn his sounding board on tough cases even as they fight their attraction for each other. The police leave no stone unturned. Re-examining the empty cottage from which the emergency call was made, they find another slipper that hadn’t been there when they first searched. The owner of the cottage, who’s been out of the country, has a checkered history: Years before she’d been accused of murdering her entire family with poisonous mushrooms. Neil, always much more loving and engaged with Daisy than her mother was, is having an affair with a client who desperately wants a child. When Tracy dies, her estranged family takes a sudden interest in the beautiful Daisy because it appears they might make some money from her tragic story. The enigmatic clues someone is providing the police lead nowhere until Martha dredges up an old memory that will help crack the mystifying case. Masters (Smoke Alarm, 2012, etc.) 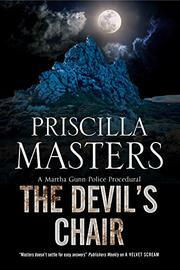 provides another entertaining procedural whose twists will keep you guessing.